This software package is an infield software upgrade to update a miniDSP 2x4 HD unit to a DDRC-24 with Dirac Live support. Please refer to the DDRC-24 User Manual to update your miniDSP 2x4 HD (p.13). Note, this package does NOT include the cost of the miniDSP 2x4 HD platform. Instead, this software is intended for existing owners of a miniDSP 2x4 HD platform looking to upgrade their unit to support Dirac Live. The activation of a Dirac Live license is a "manual" process that typically requires 24-48h during "working hours" from Mon-Fri 9am-5.30pm HK Time zone. Thanks for your patience. IMPORTANT NOTE: A UMIK-1 is not included in the default price, make sure to select one as an option since 1x UMIK-1 is required for performing acoustic measurements when using the Dirac Live software as per the DDRC-24 manual. 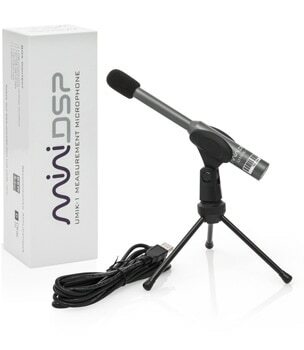 1 x Full Dirac Live for miniDSP software license - Requires a UMIK-1 to perform the measurements. On purchase of the 2x4HD to DDRC-24 upgrade, software will become available under your user downloads section. Download the ZIP file under the DDRC-24 section. Upgrade the firmware of your 2x4HD to become a DDRC-24 as per the DDRC-24 user manual. The DDRC-24 firmware can be found under the ZIP file of the DDRC-24 plugin. Start the DDRC-24 plugin. Click the Connect button in the top right. Click the button "Copy Activation Code to Clipboard"
Send an email message with the Subject line “DDRC-24 Activation Request.” In the body of the email message, paste the activation code you just copied. Click the “Import” button and select the received activation key file to import into the plugin. The Connect button will change to show that you are connected to the DDRC-24. Please make sure to refer to the DDRC-24 User Manual for further information on how to use your DDRC24. It is really magic what Dirac Live does, soundstage is wider, stereo effect much improved, speakers timing and volume corrected to the listening location, bass is now very well controlled and deeper. I have 2.1 speaker setup. It is possible to connect subwoofer directly to DSP for bass management, but I decided to keep my active subwoofer connected to the amplifier. Works great, now cannot listen without it.